Photographs of the firing directly at a-Tamimi, by Haim Scwarczenberg, 9 Dec. ’11. 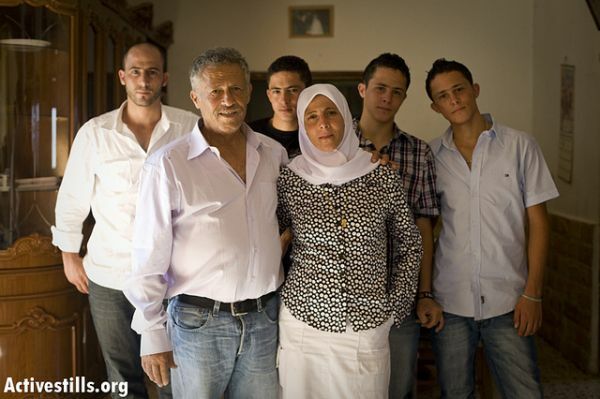 Will there be justice for Mustafa Tamimi? Mustafa Tamimi, Palestinian resident of the village of Nabi Saleh was killed last weekend, when he was shot in the head by a tear gas grenade. Anarchist activist Ben Ronen bids farewell to his good friend. “Ola is somewhere, I don’t know, Saddam is in Jordan, back soon, Louai is up there with all the shebaab (youths), Oudai – you know where he is……..in a fortnight he will be released from prison and will return to the village, and Ziad is at a wedding in Ramallah.” “And where is your son?” I ask Abd al-Razak as we sit outside under his olive tree with his wife Ikhlas, just a few minutes before the start of the weekly demonstration. “Mustafa?” He went out early today. One of his friends came by to collect him and they went to Nablus.” Maybe it’s a good idea that he keeps away from the village for one Friday,” I say. “He can be wherever he wants, he’s grown up,” Abd al-Razak replies. I haven’t been to Nabi Salah for two weeks and coming back now gives me a powerful feeling, a feeling of coming home. Even the knowledge that in just a few minutes this special calm will be replaced by a war-like atmosphere doesn’t change it. On the contrary, it is strengthened by this knowledge, and adds meaning to it. “Were you here when the army came looking for Mustafa?” Abd al-Razak asks me. In the evening, after the last of the demonstrators had dispersed, the soldiers had abandoned the village and the clouds of tear gas were hanging in the chilly evening air of the pastoral village, I went back to say goodbye to Abd al-Razak and Ikhlas. Everyone was sitting outside, Mustafa too, dressed up stylishly, as was his way. Friday evening. We are sitting at the entrance to the recovery room at Beilinson Hospital, waiting. Two hours ago we were sitting in the doctor’s room and he was explaining to us Mustafa’s condition. Someone was trying to translate his explanation, and I understood that his condition was not as severe as we had thought. It’s going to be alright, they said. One of the doctors emerges and tells us that Mustafa has been transferred to the neurosurgical department. We go up in the elevator and walk towards the admissions desk, Ikhlas is worried but we reassure her. Waiting. Another nerve-calming cigarette, before making our way back up to the ward. At the entrance, someone stops us saying quietly: “We have just been told that it is a matter of hours until he dies.” I don’t understand – none of us understand – just a few moments ago we were talking about taking everyone on a trip to the beach and to eat in Jaffa and now you are saying that he is about to die? We go into the lobby, Ikhlas’s cries split through the dreadful silence of the hospital. We try to calm her, to comfort her and give her a little hope. But she knows. She can feel it. We are waiting in the lobby of the funeral hall, I look towards the elevator and wait for it to start coming down. The numbers move slowly, the elevator stops, the doors open and a stretcher emerges, bearing a figure shrouded in a white sheet. Living people are in the room, but death is in the air. The ambulance driver has forgotten something upstairs, and we stand silently around the body, waiting for him to return, to save the situation. I sit at the back of the ambulance, as it races along the highway towards the Rantis checkpoint, I reach out and dare to touch him, first his arm and then, his head. I don’t know if this is real or not, but I do know that this is the last time that I will be close to him. After the earth had covered the last piece of the flag that the covered you, I didn’t know where to go. Then, the familiar Friday shouts started. I went closer and saw faces shouting the same familiar slogans, but their faces were different today, their tears were barely dry but they were already holding rocks, going down once again to the roadblock, to the jeeps. One of them hugs me tightly, and says: “Better to die on your feet, than to live on your knees.” I nod in agreement and think that maybe he is right and it will never end, but we will not give up. Ben Ronen is an anarchist activist and a freelance journalist. The army spokesman was right – Mustafa died because he threw stones; he died because he dared to speak a truth, with his hands, in a place where the truth is forbidden. Mustafa Tamimi threw stones. Unapologetically and sometimes fearlessly. Not on that day alone, but nearly every Friday. He also concealed his face. Not for fear of the prison cell, which he had already come to know intimately, but in order to preserve his freedom, so he could continue to throw stones and resist the theft of his land. He continued to do this until the moment of his death. According to British newspaper The Daily Telegraph, in response to the reports about the shooting of Tamimi, the spokesman of the GOC Southern Command wondered on his Twitter account: “What was Mustafa thinking running after a moving jeep while throwing stones #fail.” Thus, simply and mockingly, the spokesman explained why Tamimi was to blame for his own death. Mustafa Tamimi, from the village of Nabi Saleh – son to Ikhlas and Abd al-Razak, brother to Saddam and Ziad, to the twins Oudai and Louai and sister Ola – was shot in the head at close range on Friday. Hours later, at 9:21 on Saturday morning, he died of his wounds. A gas grenade was fired at him from an armored military Jeep at a distance of only a few meters. It was not out of fear that the person who did fired the shot hit him. He poked the barrel of the rifle through the door of the armored vehicle and fired with clear intent. The shooter is a soldier. His identity remains unknown and perhaps it will always remain unknown. Maybe this is for the best. Identifying him and punishing him would only serve to whitewash the crimes of the entire system. As if the indifferent Israeli civilian, the sergeant, the company commander, the battalion commander, the brigade commander, the division commander, the defense minister and the prime minister had no part in the shooting. The army spokesman was right. Mustafa died because he threw stones; he died because he dared to speak a truth, with his hands, in a place where the truth is forbidden. Any discussion of the manner of the shooting, its legality and the orders on opening fire, infers that the landlord is forbidden to expel the trespasser. Indeed, the trespasser is allowed to shoot the landlord. Mustafa’s body is lying lifeless because he had the courage to throw stones on the 24th anniversary of the first intifada, which begot the Palestinian children of the stones. His brother Oudai is imprisoned at Ofer Prison and was not allowed to attend the funeral, because he too dared to throw stones. And his sister was not allowed to be at his bedside in his final moments, even though she is not suspected of having thrown stones, but because she is a Palestinian. Mustafa was a brave man killed because he threw stones and refused to be afraid of a soldier bearing arms, sitting safely in the military jeep covered in armor. On the day Mustafa died, the frozen silence roaming the valley was only slightly less chilling than the shrilling sound of his mother’s laments which fell upon it occasionally. Thousands of stone-throwers followed him at his funeral. He was lowered into his grave and stones covered his body. Soldiers stood at the entrance to his village. Even the anguish and solitude of separation was intolerable for the army, who set their soldiers and arms to shower mourners with teargas as they went down to village lands following the funeral. 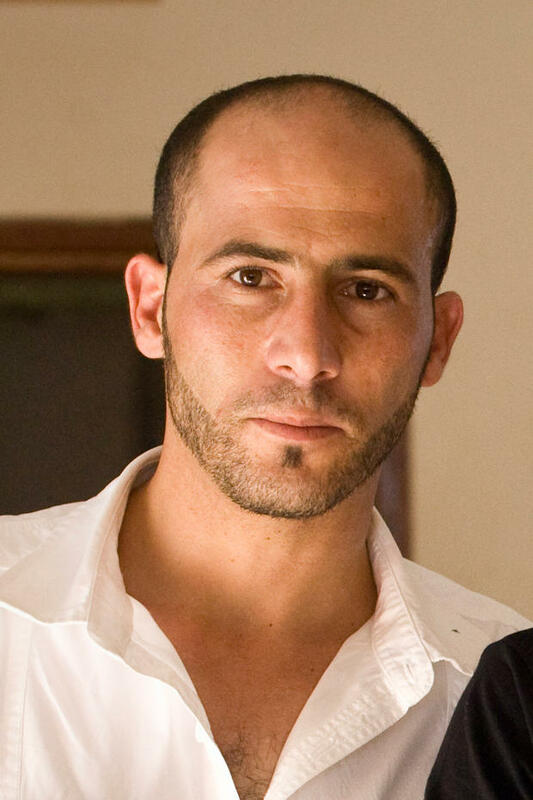 While the soldier who shot Mustafa is at large, six of the demonstrators were put behind bars. Mustafa, we walk behind your body with our heads bowed and eyes full of tears. We cherish you, because you died for throwing stones and we did not. “Mustafa and I were alone, it was just the two of us, with the rest of the protesters quite far behind, and we were chasing the jeep and telling it to leave. We got separated from the rest, because the soldiers threw almost 50 tear gas canisters at once, so the whole protest was pushed back. The tear gas went over our heads and we got closer to the soldiers, shouting at them that they had thrown enough. The jeeps turned around to leave as they were shooting gas behind us. One jeep, however, lingered and seemed to be waiting for us to get closer. As we reached the jeep, the soldier opened the door and shot two rounds of tear gas. I think I saw this soldier’s face, but Mustafa definitely saw and whoever he is, Mustafa knows best. Mustafa pushed me down, and one canister that was aimed for me flew over my head. The second one hit Mustafa, but I didn’t know it hit him at first because I thought ‘for sure they wont shoot at us from so close.’ I thought he had just ducked down, and then I thought that maybe he had just passed out from the gas, because there was gas all around him. I went to him, laying face down on the road, and I turned him over and pulled the cloth off his face. Of what I can say about it, it is worse than words can say. The whole half of his face was blown off, and his eye was hanging out, and I tried to push his eye back up. I could see pieces of the inside of his head, and there was a pool of blood gathering under him. His whole body was trembling. It started from his feet, then up to his arms, then it reached his chest, and then his head, and then a gasp came out and I’m sure at that moment he died. He gasped, and let out a bunch of air, and I knew at that moment his soul had left. I have seen many people, not a few, die in front of me, and I know death. Maybe later on they revived his heart, but I knew that his soul had left. I ran back to get people, because we were far away, but there was no ambulance around, so the people around gathered him and put him in a servee [a communal taxi] and tried to leave. The soldiers stopped the servee and tried to arrest Mustafa, but when they saw that he was on the brink of death, they began to act as if they were humanitarian, to revive his heart. But what is ‘humanitarian’, to shoot someone to kill, and then to try to help him? These were the same soldiers from the jeep that shot him. They shot him, then say they want to help him. What they really did is prevent him from leaving. The body lay on the ground for half an hour. They wanted Mustafa’s ID, and they also wanted the ID of his mother, of another family member, and of Bassem Tamimi’s wife, because these people wanted to go out with him too… They were doing some kind of medical treatment while he was lying on the ground, but this was no hospital, and what he needed was to be taken to a hospital. He should have been flown out in that moment. There is nothing you can do for him on the street there. I was with the family the whole night afterwards, especially with his father, who is very sick and on kidney dialysis. Mustafa’s family believed there was still some hope, so I did not want to tell them that I knew he was already dead. His father is very sick, and kept falling asleep and waking up again, and we didn’t tell him much at first, only that Mustafa had been shot but that, God willing, he would be okay. There are some things that are hard and give you no hope, and then there are some things that are hard, but there is something nice about them. Martyrdom is something that is hard, but it is also honorable, and that gave his family a lot of comfort. I knew Mustafa as a brother in the resistance. We were close in the resistance to the occupation. Anyone who comes out with me in our resistance to the occupation is close to me, as close as my mother, brother, or father, whether they be Palestinian, Israeli, Jewish, Muslim, or international. He was free, and a person who is free fights the occupation. That’s the thing I can most say about him- he was freedom. Mustafa Tamimi of Nabi Saleh died yesterday morning in Beilinson Hospital. There’s no debate over the cause of death: Tamimi was shot in the head at close range during the weekly demonstration in his village. The weapon: a high force, long range tear gas canister. According to a number of witnesses, backed up by photographs, the canister was fired point-blank, in total contravention of army regulations, from a distance of less than ten meters. The shooter: an Israeli soldier, from a Jeep. It’s not every day that the authorities come in possession of such a picture, which can supply more than 1,000 words in an indictment. The picture shows, firstly, the shot, an instant before the canister strikes him. This picture also shows that Tamimi may have thrown stones at the military Jeep, but it’s also clear that the Jeep is both closed and armored, and there is no doubt that Tamimi constitutes no danger to the lives of the soldiers – especially had they shut the door. In the picture you can also see the canister in the air, and the forbidden angle at which it’s flying toward Tamimi. You can’t see the shooter, but you can easily see that he was driving in military jeep S0661410. You can easily figure out who drove it by calling 02-5694211. From there it probably won’t be too hard to figure out who else was in the vehicle, and who opened the door to fire at Tamimi. But this won’t happen. Unlike Bassem Tamimi – an organizer of the demonstrations in Nabi Saleh, who has been in jail since March and whose trial used testimonies taken from minors pressured by illegal interrogation methods – it’s safe to assume that the soldier who shot Mustafa Tamimi won’t be arrested in the near future. He won’t sit in jail while awaiting trial for murder, or manslaughter, or even negligent manslaughter. The past has proven to us that maybe, just maybe, if some organizations and dedicated attorneys invest in a prolonged military struggle, the soldier will be charged with firing against regulations, or illegal use of a weapon, or a moving violation like driving in a military vehicle with the door open. Maybe, just maybe, he will be convicted and demoted, and maybe he’ll even be fined or get a two-month sentence. Suspended sentence, of course. But maybe not. I haven’t been to Nabi Saleh. They have been protesting there against the occupation for two and a half years, against the army-supported settler seizure of the village’s lands and spring. But I haven’t made it there. I have written on several occasions about the struggle there, but I didn’t join the demonstrations. I’ve been to Bil’in, Ni’lin, Ma’asara, Um Salmona, Jius, Hebron, Susya, Salfit, Azon, Jenin, Beit Ommar, Ramallah, Jericho, Walajeh, and more – but I haven’t been to Nabi Saleh. 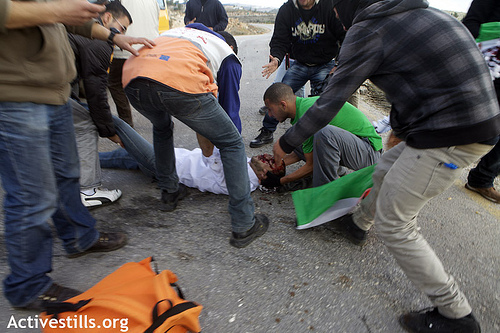 The photographs of violence that have come out of Nabi Saleh simply scared me. The beatings, the rubber bullets from close range, the many wounded, and the army that roams the streets and fires tear gas into homes around the village – there’s nowhere to hide. Nobody had been killed until now, but it was just a matter of time. My friends told me that things had calmed down there lately, that it wasn’t like it had been at the beginning, that it was manageable, that you could fade back and find safety if you wanted to – I started to consider going. More and more friends on Facebook are sharing the close-ups of Tamimi’s head after he was shot – covered in blood – and the video clips of his evacuation. I have no choice but to look at the photographs, and my body stiffens, freezes, shakes a bit. Before I was notified of Tamimi’s death, the photographs reminded me of Tristan Anderson, the American whose skull was shattered by a similar canister by similar soldiers in Ni’lin, in a demonstration at which I was present. I remembered the horror of that day, and the time that Anderson then spent in the hospital, hovering between life and death until he left in a wheelchair, in which he’ll probably remain for life. I remembered Matan Cohen, and Limor Goldstein, and their injuries, and my own light injuries. I remember Bassem and Jawaher Abu Rahma, who were killed in Bil’in, and 10-year-old Ahmed Moussa, who was killed by soldiers in another demonstration – and more. It is simply shocking. Truly shocking. I look around, and I don’t see my society shocked. Not shocked at all of these people, or at the two head injures in Nabi Saleh yesterday, or at the two arrests in a peaceful demonstration in Ma’asara, which didn’t even get any coverage. I see the careful reports reading, “Palestinians claim that…” and the blind faith in the stance of the IDF Spokesperson. And the lack of shock shocks me even more. Especially shocking after all this are the reader comments, which claim that “they deserved it” or that describe the weekly popular demonstrations in the occupied territories, despite the repression and the injuries and the arrests and the terror and the death, as a “game,” or “theater,” or a “hangout of anarchists and bored Arabs.” And I hope that somehow, the UN Special Rapporteur on Free Speech, who spent Friday in Nabi Saleh when Tamimi was shot, sees and understands what is happening here, and maybe will manage to give us some assistance from outside. He, or the European consuls who are witnessing the trial of Bassem Tamimi, or diplomats who document the destruction of the caves and wells in the South Hebron Hills. But I have a hard time believing. But – a shred of hope? Despite it all? Is there a source of encouragement, alongside all these killings, alongside the father of son who were killed in Gaza, and the death and bereavement that follows us everywhere thoughout this land of occupation and repression and war? Yes. The human spirit. It may be a cliché, but I believe in the words of Charlie Chaplin: We want to live by each other’s happiness — not by each other’s misery. We don’t give up on the eternal struggle for a future that is better, freer, more equal, more just, and in the long run, we achieve something. Capitalism and racism may incite us to selfishness and war, but ultimately, occupations collapse, empires fall, and humans continue to create and protest and build and love. And alongside such pictures of murder, this must be remembered. Haggai Matar is an Israeli journalist and political activist, focusing mainly on the struggle against the occupation. He currently works at Zman Tel Aviv, the local supplement of Maariv newspaper, and at the independent Hebrew website MySay. This piece originally appeared on MySay. Translated by Noa Yachot.